Sure, there are the fun ‘what’s in my suitcase’ posts that you see all through fashion week (or month), but how about the secret stuff that never gets a mention? They’re the non-glamorous essentials but the real travelling heroes. Here are the best packing lessons I’ve learnt from my fellow blogger friends, and the one that I’ve recently started adding to the list. 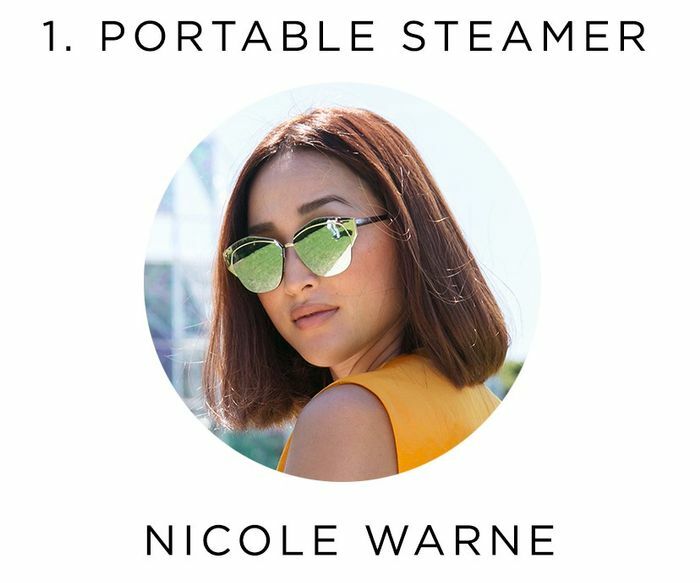 Keep scrolling to see what Nicole Warne, Margaret Zhang, Geneva Vanderzeil and Zanita Whittington won’t travel without. I wasn’t surprised when Nicole from Gary Pepper unveiled her secret packing tip. The penny dropped as to how and why she always looks so polished on her travels and that’s due to her handy portable steamer. Thanks Nic! This is one for the ages. If you’re visiting more than one country then this is a lifesaver. Zanita taught me this trick and I had to go source one for myself straight away. The all-in-one adaptor is so much better than carrying around a bunch of different ones for every country you visit. Plus, if you're like me and can never find your adaptors during the last-minute pack before your flight, you'll save money by only having to buy the one (even if you do have to pick one up every time you travel). It’s hard to beat the feeling of clean underwear when the entire contents of your suitcase has been worn at least three times. I was given this hot tip by Geneva from A Pair and a Spare, who got me onto Calvin Klein’s quick-dry fabric underwear. They’re perfect for when you’re washing your unmentionables in your Airbnb bathroom sink. One of the issues I have with travelling for my website, Harper & Harley, is that I begin to really miss my healthy everyday rituals like my protein smoothie in the morning. Convincing myself that I’ll be saving time and money (plus making me feel less homesick) I’ve started to pack my light and compact blender with me when I travel. This may seem like the craziest tip of the list but it's one of the items in my suitcase I’m most excited about. If you're feeling inspired to dress like some of your favourite bloggers, Net-a-Porter has you sorted for some blogger-approved buys! What do you pack in your suitcase that you can't travel without? Share your tips in the comments below.